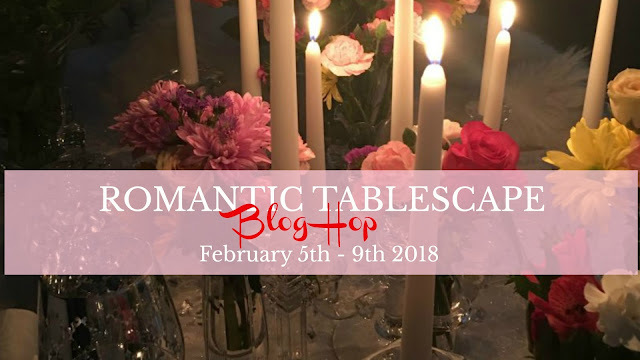 Hello Friends, another Blog hop for you to enjoy and gather some ideas for Valentines. 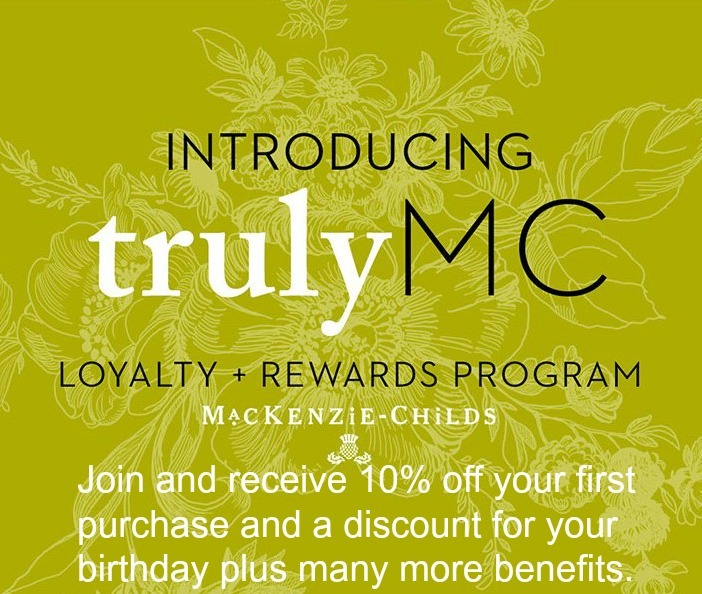 Chloe from Celebrate and Decorate has organized this fun event. The participating blogs are listed at the bottom. Have fun! 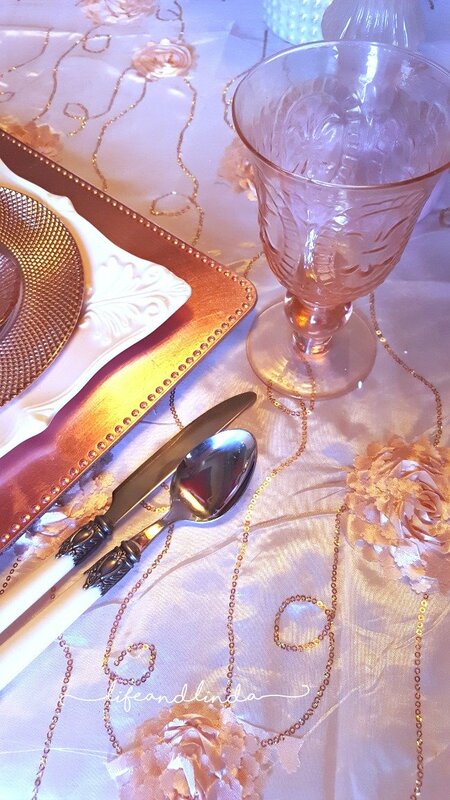 Blush look for this Valentine's table. From plate chargers to the pretty salad plates. I created these pretty pink roses from my blush pink napkins. They add some romance to your table. A simple method of folding and rolling. This tablecloth is more of a blush pink with roses. Lovely pink peonies in a creamy white vase. I tucked in the pink foam heart from the dollar store. The ombre hearts I made in an previous post, hang on the backs of each chair. I am using the lovely salad plates from pottery Barn. They are called Monique Lhuiller Melrose. If you follow my blog, I am known to dress my chandeliers. I feel they make the theme pop. 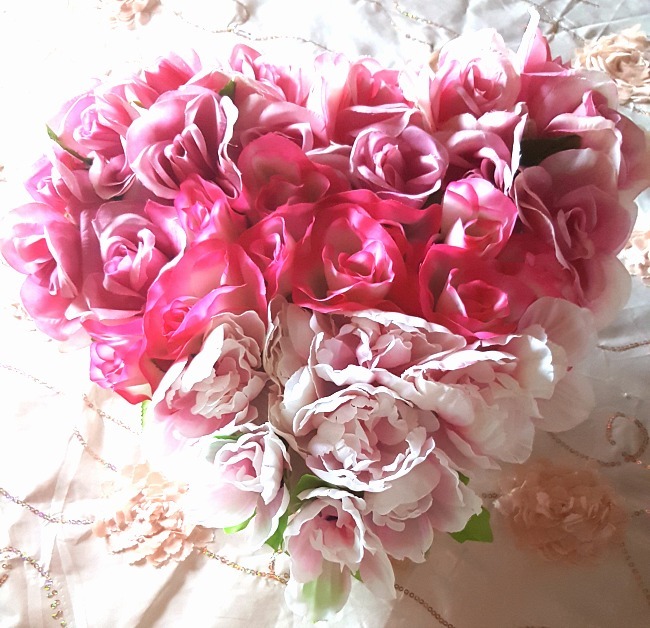 I am using these lovely pink roses and took the decor to another dimension by adding the pink foam hearts. What is better than candlelight, flowers, some sparkly, sweets and your love? The Red Painted Cottage * Celebrate & Decorate Sharing at some of these fabulous parties. Beautiful! Blush is my color of the year, love it! Hi Donna, blush is such a pretty color without being too pink. Thank you Mary. I believe in dressing the whole room. Before, I read Mary's comment luscious was the first word that came to my mind, too. I love the softness and sweetness of your table. Your gorgeous tablecloth,dishes and flatware are beautiful. I love your napkin fold in a rose. I am going to try that. All your DIY embellishments are amazing! I still don't know when you sleep! Have a great week. Bonnie, you are so funny. I do sleep, sometimes...LOL Do try the rose napkin fold. It is very easy. Looking forward to seeing your fabulous table. 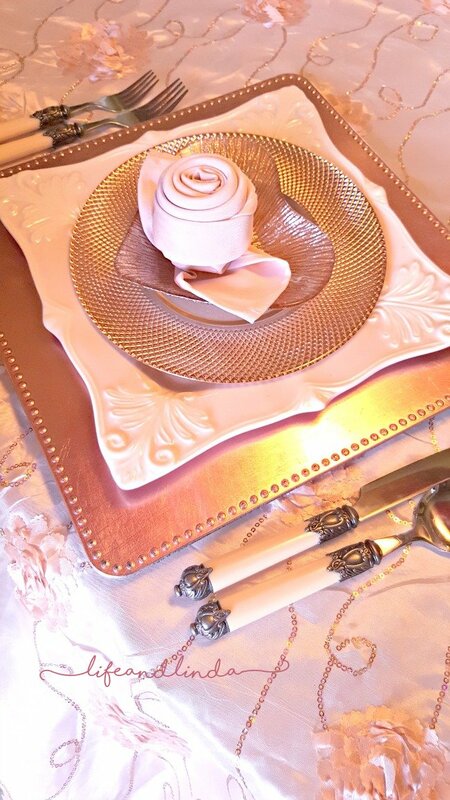 I just love this blush pink Valentine tablescape. This is looking beautiful and perfect for Valentine. 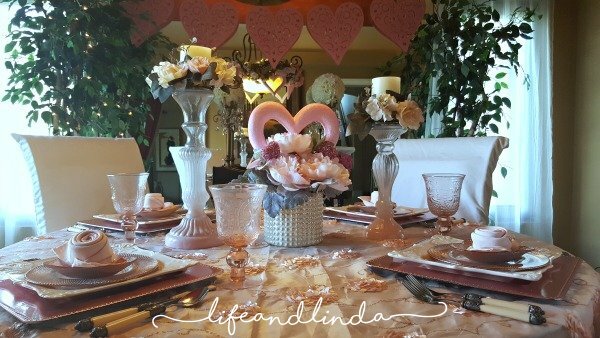 Linda, blush is the perfect color for a sweet Valentine’s table! The chair covers, chandelier, and place settings are all stunning. Your rose napkin fold is a lovely embellishment! You have created a lovely setting! Thanks so much Pam. I thought I would use pink this year, since most Valentines I use red. Gorgeous!! 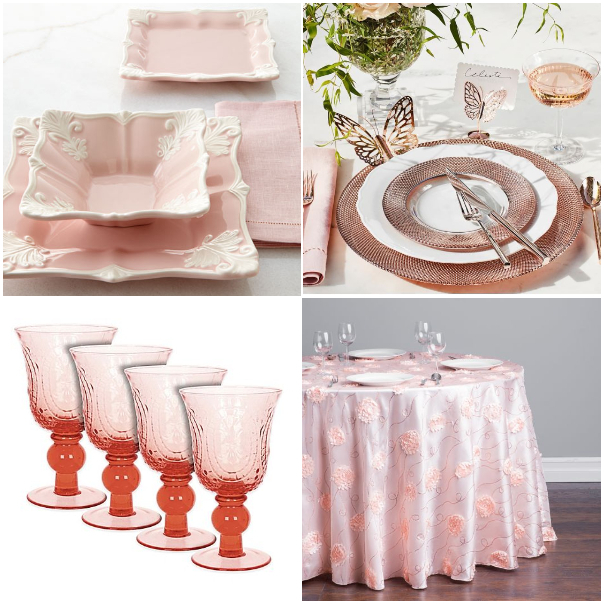 Love your blush plate stack, the tablecloth is the perfect backdrop for it. Your rose napkin fold is the cherry on top!! Just a wonderful Valentine's setting!! Thanks so much Ann. The cherry on top really makes it all pop! I do love blush pink and this is so pretty. Lucious is a perfect word. That is the sweetest napkin fold and I love the PB dishes. The ombré hearts look so pretty on the chairs. Beautifully designed and romantic table! Thank you Liz. Blush seems to be in this year and I am loving it. A change from my usual red. Thank you jenna for your sweet comment. I am so looking forward to your Valentine table. Very pretty, Linda. The rosebud fold is so simple - had no idea! Your plate stack is gorgeous, but those ombre hearts I just love! I'm an all cotton, practical bedding kind of girl, but you inspire me to purchase silky pillowcases just to use as chair covers. Rita, do try the rose napkin fold and by all means, use pillow cases in your chairs. You can use cotton ones as well as the silky kind. Quite stunning, Linda! You've outdone yourself, once again! Everything looks beautiful and very romantic! I love that you included a video on how to fold a napkin into a rose! Can't believe how easy it is! Thanks! Gail, you are so sweet. Try the napkin fold, You will be amazed as to how easy it is to make. Lovely! 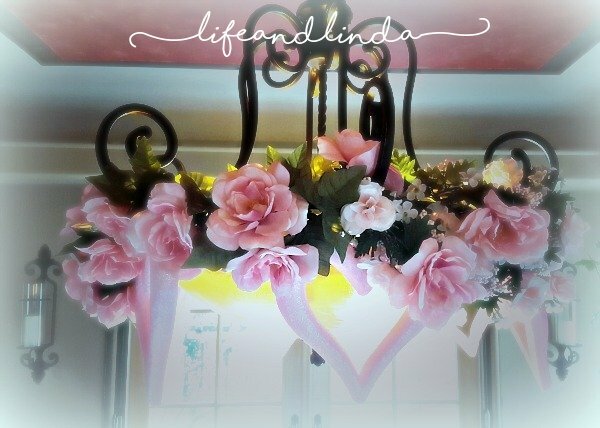 And thank you for adding the tutorial..smitten I am:)♥You suit Valentine's Day Linda! You are so welcome. Thank you for your sweet comment Monique. Smitten is good thing! Just love. So pretty. Love the rose napkins too. Very romantic and pretty. 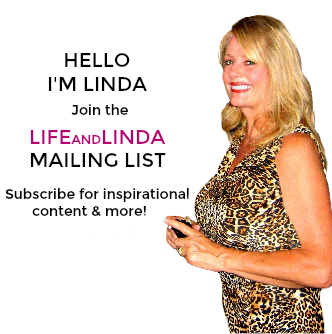 This is absolutely gorgeous Linda! Oh how I adore pink and would love to come over for tea and sweet treats sitting at your table! So pretty! 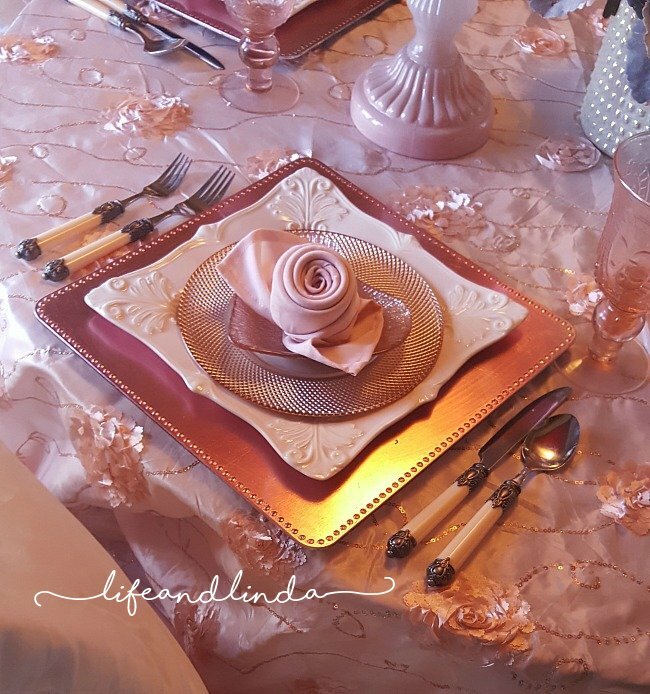 Linda you have done it again...this blush tablescape is beautiful. I love your attention to detail and I must learn how to make those adorable rose napkins. Thanks for the tutorial. This table definitely is romance at it's best. Great job. You are so sweet, thank you. I hope you try making the rose napkins. Romance is key Debbra. Love your recent post. Made me laugh! Linda, the blush pink is so pretty. I love your soft and sweet tablescape. All the flowers have just the right feel. I decorate our chandelier too! Carol, isn't decorating our chandys the best? Icing on the cake. Goegeous as usual Linda! Especially love the tablecloth. Mind sharing info on it? This table really is luscious, my friend! I love, love all the blush pink. 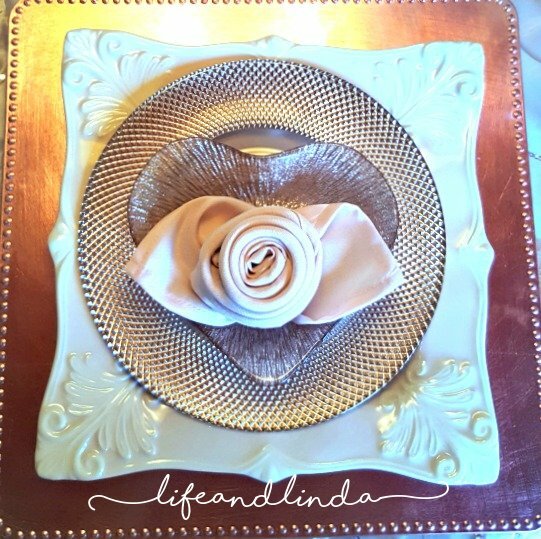 Your rose-shaped napkin folds really add a beautiful touch; thanks so much for sharing the instructions with us. 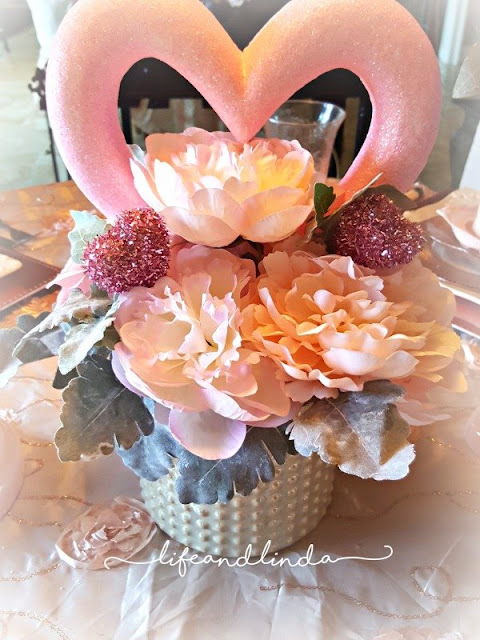 I love all the crafts you've made to go along with the table -- wishing you a lovely Valentine's Day! Oh my goodness Linda! This tablescape is simply stunning! 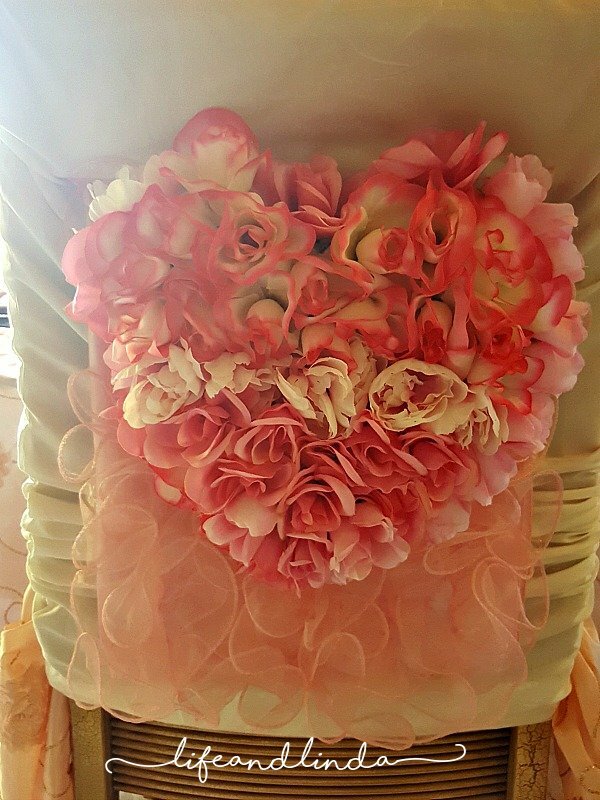 I'm obsessed with pink and blush and the way you used the Dollar Store heart is just lovely! Thanks Michelle. Gotta love the dollar store. 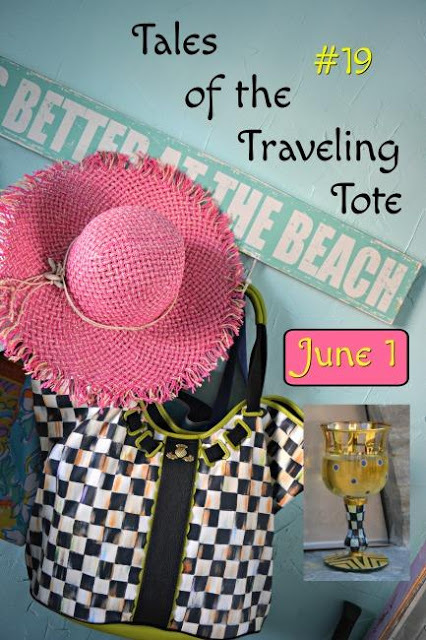 Decorating and crafting are so inexpensive with their products. Thanks Sherry. I tried visiting your blog, but it says not available. Linda, there are so many great things going on here. I watched the entire tutorial on the pretty rose napkins, and cannot wait to try them myself. Also you are a bad influence on my plate addiction with those gorgeous Monique Lhuiller plates, I want them. The ombre roses are lovely too! So pretty, love your plate stack, and those napkin roses! 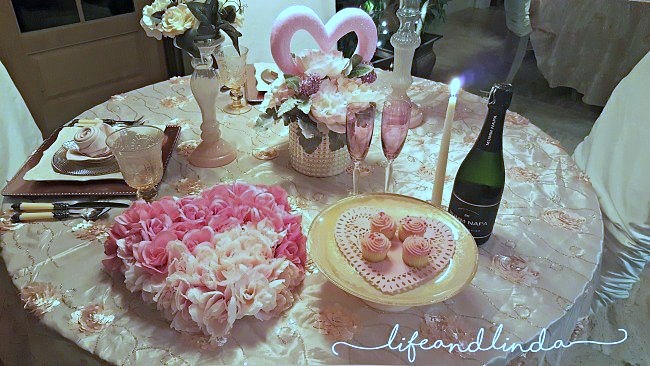 Linda, your tablescape is just beautiful... so soft and feminine. Enjoyed your post! Linda, I love the blush color you've chosen. It's so perfect for any time of the year. I made the same rose napkins for my tablescape, but yours look so much better. Everything is such perfection! Beautifully set, Linda. I know your valentine will appreciate this pretty table. Happy Valentine's Day to you and Paul. this is such a beautiful Valentins-Table! I love all the soft tones of this tablescape and how it speaks of a quiet intimate atmosphere perfect for two! 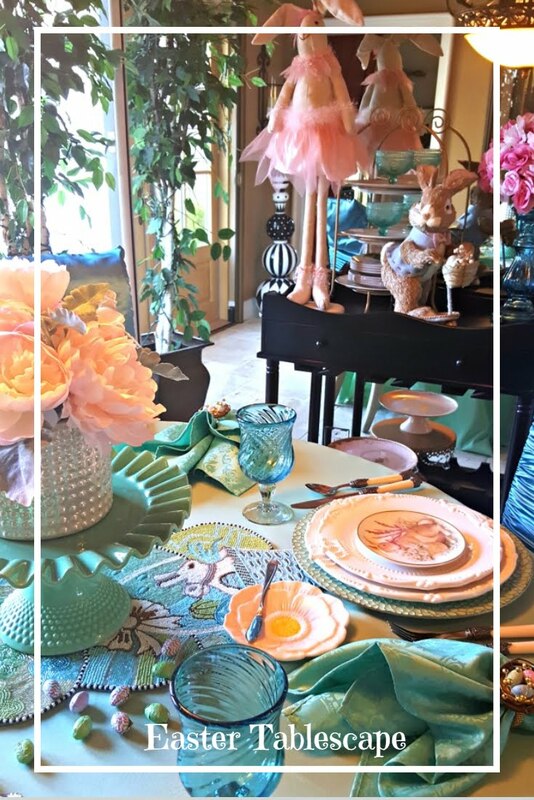 Those PB salad plates paired with the blush stemware look wonderful together. The pretty design on your tablecloth makes a lovely backdrop. Adding the decorations to your chandelier and the chairbacks is the icing on the cake - great job! My favorite colors are all here in one place on your lovely Valentine tablesetting! Truly this table is a work of art and these rose shaped napkins, the tablecloth and oh your chandelier. Lovely, lovely my dear! 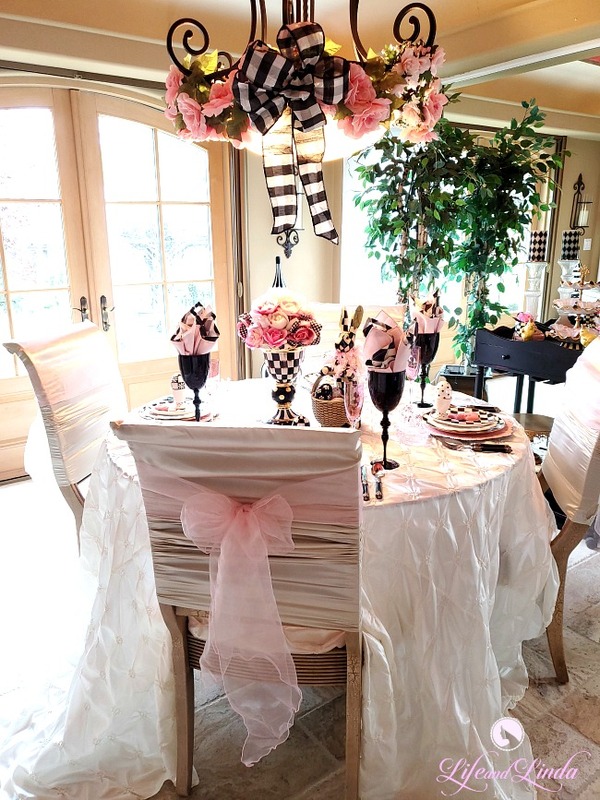 Linda, this tablescape is stunning from the pretty pink theme to all of the special touches that you added. The decorations on the chandelier and the beautiful floral hearts on the back of the chairs add such a lovely finishing touch. That tablecloth is absolutely gorgeous...it is what first caught my eye. I hope you have a Happy Valentine's Day!!! 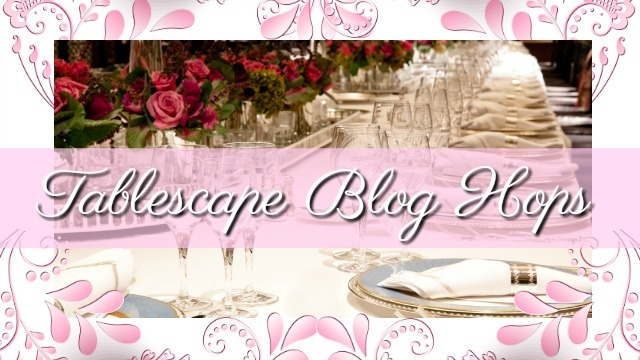 I am loving blush pink right now, and your tablescape is simply lovely! Your attention to detail with the napkin (thank you for the tutorial! ), the ombre heart and decorated chandelier is gorgeous! So very pretty. The perfect setting for a romantic evening! Beautiful elements, beautifully assembled. Those little rose napkins are adorable, thank you for the tutorial! This looks like a perfectly intimate table for two, and I hope you enjoy it! Just stunning! Those ombre hearts are magnificent! I just love blush - so soft and feminine and romantic. The rose napkin just sets the mood! Always wonderful to be at your tables! Yet another AMAZING decorating feat by Life and Linda! How lovely is that??? 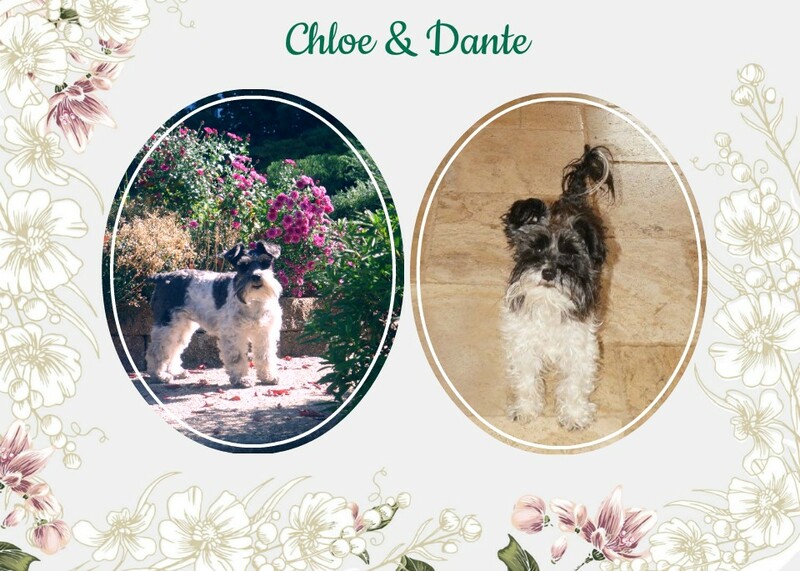 So very feminine and sweet. You just bowl me - and so many others - over with your talents!!! Oh, my, I want to dine at this table, it is so romantic and beautiful. And, it doesn't hurt that I'm a big fan of pink and blush. Have a great Valentine's week Linda! You are beyond talented!